Young parents have specific needs and systems are not designed with these families in mind. In the state of New Jersey, where affordable quality child care is hard to find, for young parents without education or training, the danger of capturing two generations in a poverty cycle is often a sad reality. 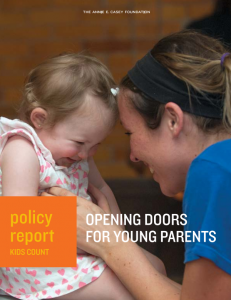 On Tuesday, September 25th, ACNJ partner, The Annie E. Casey Foundation, released a special report, Opening Doors for Young Parents, with the goal of examining national and state-level trends, highlighting areas of opportunity and concerns and sharing potential solutions to help these families thrive. “Access to affordable, quality, childcare remains a challenge, and programs and services intended to help at-risk families, like home visitation, are not reaching enough new parents in New Jersey,” said Cecilia Zalkind, ACNJ’s president and CEO. Read the NJSpotlight story here, and find a complete copy of the report here. ACNJ is committed to advocating for the supports all New Jersey families need to give children an opportunity for a healthy start. Join our campaign to help put the needs of babies and their families on the public agenda. By signing up you will receive emails and action alerts with the latest on issues affecting NJ's babies. ACNJ is a proud partner of the national ZERO TO THREE Think Babies campaign and The Right From the Start NJ campaign, in collaboration with the Turrell Fund, The Nicholson Foundation and the Caucus Educational Corporation. Visit RightFromTheStartNJ.org to learn more about the critical importance of the early years of child development, from birth to three.